Hi-tech protection. It reads: "Fingerprint scanner" - on the wheel lock - "Theftproof", "GPS Monitoring", "Neighbourhood Watch". Bicycle theft is a hot topic at the moment in Copenhagen. There has been an increase this year in the number of bicycles stolen in Denmark. 7000 more bicycles have been nicked in the year's first three quarters than at the same time last year. Actually, 222 bicycles are stolen in this country every day. Two students from Denmark's Technical University [DTU] have, in their thesis, described how Danish insurance companies profit from bicycle theft and do little to stop it. It's great business for them. First, a bit of background. In Denmark, bicycles are covered under your household insurance. If you have storm damage on your house, break a vase or get your bike stolen somewhere in the city, it's the same policy that covers it. You may have to pay an extra fee for bicycle insurance, but it's not excessive. When I buy a bike, the bike shop registers the frame number and my name into the system and my insurance company thereafter registers it in their system. If my bike gets stolen, I register the theft on the police website - takes a couple of minutes - and then call or email my insurance company. I'll usually get a pay-out within the week. It's quite a fluent system. On the other side of the coin, if I get caught stealing a bike, I am required to pay a fine of 1400 kroner [$280 / €186]. Not that anyone is looking for the perps. In 2008, the police caught the thief in 0.46% of all cases. Fair enough, when you have so many bicycles in a country or city, the police can hardly be expected to run around looking for the stolen ones. There's more important things for them to do. What is rather odd is that the insurance industry is not all hot and bothered about the many bike thefts in Denmark. As twisted as it may sound, bicycle theft is profitable for them. Sure, back in 1993 the insurance industry was involved in implementing rules regarding approved locks on all new bicycles sold - the wheel locks that most of us use in Denmark - which caused a massive fall in the number of bicycle thefts. But the industry is not active in working towards reducing the number of stolen bicycles. Why? Bicycles are covered by household insurance policies. Many young people don't bother with household insurance but the insurane companies, for obvious reasons, wish they did. Funnily, they are active in sending out press releases that hype the rise in bike theft and one company, for example, published a brochure in August with the title "School start is high season for bike thieves". They wrote a list of preventive steps to take to avoid bike theft and one of them was, not surprisingly, "Cover your bicycle with household insurance". Insurance industry pay-outs for stolen bikes make up 5.6% of all pay-outs on household insurance cases. Bike theft costs the industry 170 million kroner [$34 mil. / €23 mil] a year in pay-outs. The average pay-out is only 3,356 kroner [$670 / €450]. In comparison, the average pay-out for a burglary is 23,360 kroner [$4700 / €3100] - seven times greater. Apart from selling household insurance policies, pay-outs for bike theft are great for customer service and customer loyalty. A quick, efficient pay-out for a stolen bike is something that people appreciate. Paying for stolen bikes is a small amount compared to storm damage on houses so insurance companies are happy to do it. Especially since it's profitable. Crime pays. If you look further along the food chain, bike shops profit from stolen bikes, too. They sell new ones and they buy stolen ones cheap from police auctions. 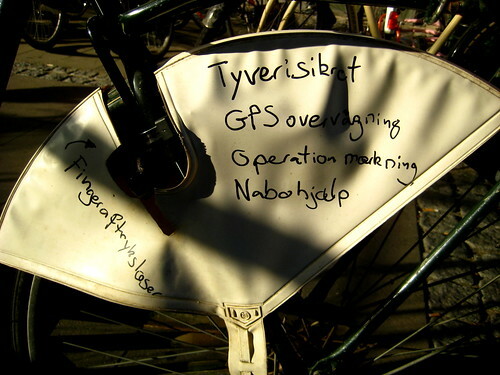 The people behind the City of Copenhagen's current test of RFID chips that will help in tracing stolen bikes were hoping for support from the insurance industry, but they were disappointed.